Mr. Fuji forms a tag team with Professor Toru Tanaka and were managed by the Grand Wizard ———- [Fuji/Tanaka Profile]..
~~~Toru Tanaka provided his massive physical strength while Mr Fuji brought his devious ring psychology to the team..
June 27, 1972: Mr. Fuji & Prof. Toru Tanaka defeated Sonny King & Chief Jay Strongbow to win the WWWF Tag Team titles..
September 2, 1972 – WWWF: Mr. Fuji & Prof. Toru Tanaka defeated Gorilla Monsoon & Manuel Soto to retain the tag titles. September 12-13, 1972 – WWWF: Mr. Fuji & Prof. Toru Tanaka defeated Gorilla Monsoon & Sonny King to retain the tag titles. October 9, 1972 – WWWF: Mr. Fuji & Prof. Toru Tanaka defeated Fred Curry & Jack Brisco to retain the tag titles. October 16, 1972 – MSG: Mr. Fuji & Toru Tanaka wrestle Pedro Morales & Bruno Sammartino in the main event of the card..
November 11, 13, 1972 – WWWF: Mr. Fuji & Prof. Toru Tanaka defeated Chief Jay Strongbow & Sonny King to retain the tag titles. December 15, 1972 – WWWF: Mr. Fuji & Prof. Toru Tanaka defeated El Olympico & Gorilla Monsoon to retain the tag titles. 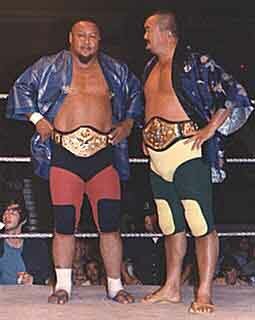 May 19, 1973 – WWWF: Mr. Fuji & Prof. Toru Tanaka defeated Manuel Soto & Tony Garea to retain the tag titles. May 30, 1973 – WWWF: Tony Garea & Haystacks Calhoun defeated Mr Fuji & Toru Tanaka to win the WWWF Tag Team titles..
June 4, 1973 – WWWF: Gorilla Monsoon & Haystacks Calhoun defeated Mr. Fuji & Prof. Toru Tanaka in a best 2 out of 3 falls match. July 23, 1973 – WWWF: Haystacks Calhoun & Tony Garea defeated Mr. Fuji & Prof. Toru Tanaka in a best 2 out of 3 falls match. 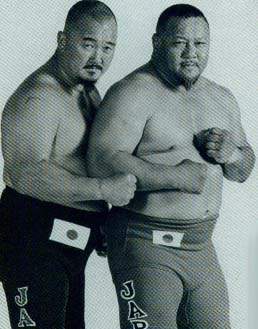 September 11, 1973 – WWWF: Mr. Fuji & Toru Tanaka defeated Tony Garea & Haystacks Calhoun to recapture the WWWF Tag Team titles..
September 21, 1973 – WWWF: Gorilla Monsoon & Pedro Morales defeated Mr. Fuji & Prof. Toru Tanaka. November 14, 1973 – WWWF: Dean Ho & Tony Garea defeated Mr. Fuji & Prof. Toru Tanaka to win the tag titles. November 17, 1973 – WWWF: Pedro Morales & Victor Rivera defeated Mr. Fuji & Prof. Toru Tanaka. November 21, 1973 – WWWF: Andre The Giant & Chief Jay Strongbow defeated Mr. Fuji & Prof. Toru Tanaka. November 30, 1973 – WWWF: Andre The Giant & Dean Ho defeated Mr. Fuji & Prof. Toru Tanaka. March 9, 1974 – WWWF: Dean Ho & Tony Garea defeated Mr. Fuji & Prof. Toru Tanaka to retain the tag titles. March 16, 1974 – WWWF: Chief Jay Strongbow & Pedro Morales defeated Mr. Fuji & Prof. Toru Tanaka in a best 2 out of 3 falls match. April 1, 1974 – WWWF: Dean Ho & Tony Garea defeated Mr. Fuji & Prof. Toru Tanaka by disqualification to retain the tag titles. 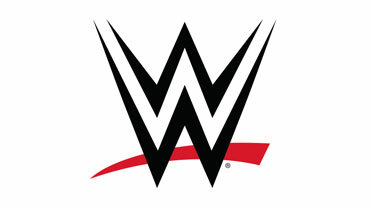 September 19, 1975 – NWA Georgia: Mr. Fuji & Prof. Toru Tanaka win the NWA Georgia Tag Team titles in a tournament final..
November 14, 1973: Tony Garea & Dean Ho defeated Mr. Fuji & Toru Tanaka to win the WWWF Tag Team titles..
Mr. Fuji & Toru Tanaka take Classy Freddie Blassie on as their manager..
September 27, 1977: Mr. Fuji & Toru Tanaka defeated Tony Garea & Larry Zbyszko in the tournament final to win their 3rd Tag titles..
January 23, 1978 – MSG: Fuji/Tanaka/Stan Stasiak/Mikel Scicluna wrestled Bob Backlund/Peter Maivia/Tony Garea/Larry Zbyzsko..
May 20, 1978 – MSG: Dusty Rhodes/Mil Mascaras/Andre the Giant defeated Mr. Fuji/Toru Tanaka/Ken Patera in a 2/3 falls match..
May 14, 1979 – AWA: Mr. Fuji & Toru Tanaka defeated Bill Dundee & Robert Fuller to win the AWA Southern Tag Team titles..
June 29, 1979 – NWA Southeastern: Fuji/Tanaka beat Ron Fuller & Buddy Fuller to win the NWA Southerneastern Tag Team titles..